TSENG, Shu-hsien and CHEN, Li-chun and SHAO, Hsiu-Mei (2017) Good Books Spread a Thousand Miles Electronically: the Global Sharing of Taiwan Resources. Paper presented at: IFLA WLIC 2017 – Wrocław, Poland – Libraries. Solidarity. Society. in Session 112 - Poster Sessions. 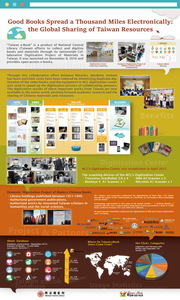 Taiwan eBook - National Central Library collect and digitize books and materials through its nationwide Collaborative Digitization Project of Materials in Taiwan. It was launched on November 8, 2016 and provides open-access e-books. In 2015, National Central Library began inviting university libraries, public libraries, government agencies, and research institutions to participate in the digitization project. 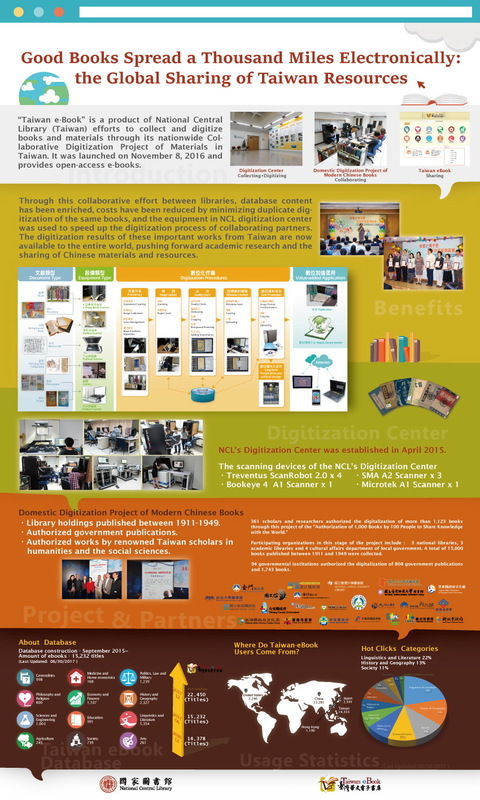 The subject of digitization is the Chinese-language books published in Taiwan or mainland China from 1911 to 1949. A total of 15,000 books were collected; another 91 government organizations also joined in the effort, thereby adding 795 e-files and 1,433 printed government publications; finally, a total of 357 individuals also authorized 1,106 volumes of their published works. Through this collaborative effort between libraries, database content has been enriched, costs have been reduced by minimizing duplicate digitization of the same books, and the equipment in NCL digitization center was used to speed up the digitization process of collaborating partners. The digitization results of these important works from Taiwan are now available to the entire world, pushing forward academic research and the sharing of Chinese materials and resources.